Anna Hazare and his associates will be released on Tuesday night from Tihar Jail after police decided to withdraw its case against them. Delhi Police sources said that warrants of release have been sent to Tihar Jail authorities for freeing Mr. Hazare and his seven associates who were held on Tuesday morning ahead of their plans to launch an indefinite strike for a strong Lokpal. The sources said the decision to release was taken after the government came to the conclusion that keeping him in jail would create unnecessary law and order situation. Tihar jail sources said that all the eight had been kept in separate lock ups and would be freed soon. Mr. Hazare and his associates had refused to take food during their detention under judicial remand. Earlier in the day, Mr Hazare was sent to seven days’ judicial custody after he refused to sign a personal bond and come out on bail following his arrest. Three other leading activists of the team Mr. Hazare — Kiran Bedi, Arvind Kejriwal and Manoj Sisodia — were also sent to judicial custody on similar grounds. Noted lawyer Shanti Bhushan was also among those arrested. Mr. Hazare, who was arrested in the morning on grounds of apprehension of breach of peace following his intention to defy prohibitory orders to go on an indefinite hunger strike, was produced before a Special Executive Magistrate. Delhi Police Commissioner B.K. Gupta told a press conference that the police was not keen that he should be sent to judicial custody. Mr. Gupta said the police was prepared for his being released on a personal bond if the Gandhian would have given an undertaking that he will not defy Section 144 of the CrPC that prohibits gathering of five or more people and also ask his supporters not to do so. Sources said since Mr. Hazare refused to give an undertaking, the Magistrate remanded him to a seven-day judicial custody. 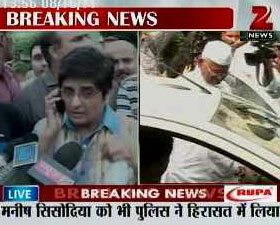 Mr. Hazare was taken to Jail No. 4 in Tihar Central Prison where he will be lodged for the next seven days. Mr. Kejriwal, Ms. Bedi and Mr. Sisodia were lodged in Jail No. 1. Hundreds of supporters gathered outside Tihar jail after Mr. Hazare and his associates were taken inside the prison.